The Kafra Service and Professor Yggdrasil have been hard at work finding a way to summon monsters to your side, not to assist in battle, but to be your steadfast companion. We are proud to announce that the first phase of the Cute Pet System is ready just in time for our 5th Anniversary Celebration! For information on the 5th Anniversary Quests, please Click Here. To begin, open your Monster Summon Collection window. The default hotkey for this window is "]". You will find that there are now two tabs in the DNA combination section. When working with Cute Pets, you will need to select the "Pets" tab. DNA: As with regular monster summons, you will need to collect the DNA fragments of the pet you wish to create an egg of. Instead of using Binding Protein, when working with Cute Pets you will need to acquire PluriEgg Blanks. PluriEgg Blank: A strange hollow egg that can hold Monster DNA. Combining them will allow you to create a Pet Egg. 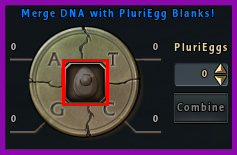 In order to transform your A, T, C, and G DNA fragments into Pet Eggs, you must add a PluriEgg Blank. To use the item, drag into the center position of the DNA Combination window on the "Pets" tab. 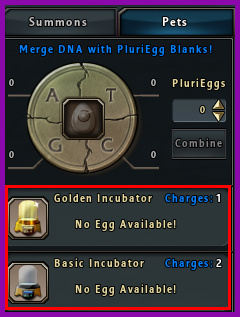 You can transform multiple PluriEggs into Pet Eggs at one time, as long as you have the required DNA fragments. Pet Egg: A Pet Egg for the monster type you have combined DNA Fragments of. Must be placed in an incubator to hatch. The Incubation Time varies depending on the pet type. Incubation time will be displayed when you mouse over the Pet Egg item. Incubation will occur regardless of if you are logged on to the character. Basic Incubator: An Incubator for Pet Eggs. Has 2 uses or "charges" and can hold 1 pet egg at a time. Incubates Pet Egg at normal speed. Available for purchase during the Anniversary Event from Nurse Bliss. After the event, this incubator will be made available through the Kafra Service in exchange for zeny and Diamonds. Golden Incubator: A special incubator for Pet Eggs. Has 3 uses or "charges" and can hold 1 Pet Egg at a time. Reduces incubation time by 25%. Available for purchase in the Kafra Shop. You have space to equip TWO incubators. Once an incubator is equipped, it cannot be removed and will remain until all three charges are consumed. To equip an incubator, drag the item from your inventory to one of the two spaces in the menu. To use a Pet Egg, drag the egg from your inventory to one of your equipped incubators. A confirmation will be shown. The Incubator will display the time remaining for incubation of the egg. When the incubation is complete, a button will appear to allow you to collect your egg. When your Pet Egg has been incubated for the required amount of time, you will be able to collect a Hatched Egg. Hatched Egg: Contains the Cute Pet of this egg type. Using a Hatched Egg will automatically add the pet to your collection. If you already own this pet type, consuming a Hatched Egg will provide your pet with a Loyalty increase. As you raise your new Cute Pet you can make it stronger by increasing its Loyalty. The number of Hatched Eggs required to raise the Loyalty of the pet to the next level depends on the rarity of the pet. Please Note: Currently, the only way to raise Loyalty is through consuming Hatched Eggs of the same pet type. As the Cute Pet system is expanded, additional levels of Loyalty as well as ways of increasing Loyalty will be added. The Loyalty progress of each pet is displayed in the Pet window. Currently, Cute Pets start at Level 0 and can reach Level 1 as a maximum Loyalty. To quick summon your active Cute Pet, drag the Poring Icon buff to your skill bar. 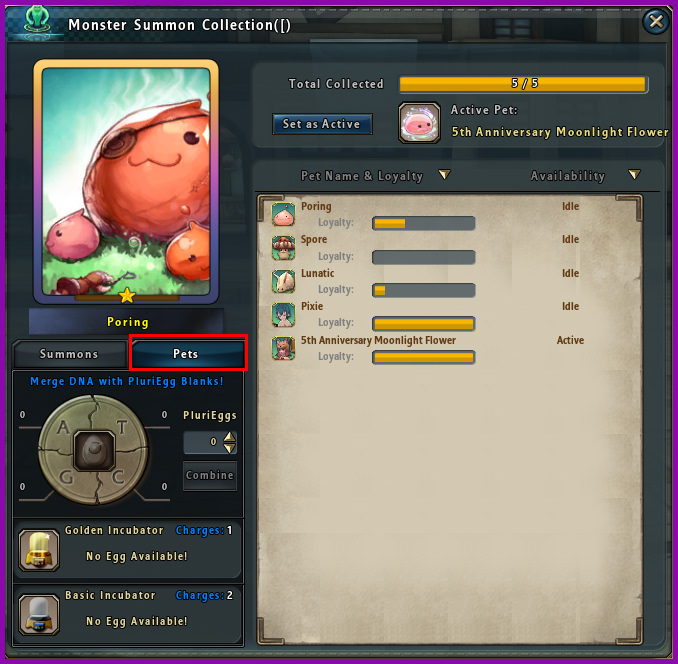 Switching your active pet in the Monster Summon Collection window will change the pet type that is summoned. You do not need to drag this skill to your bar for each pet. If you wish to change the pet type that is summoned, select the pet then click "Set to Active". 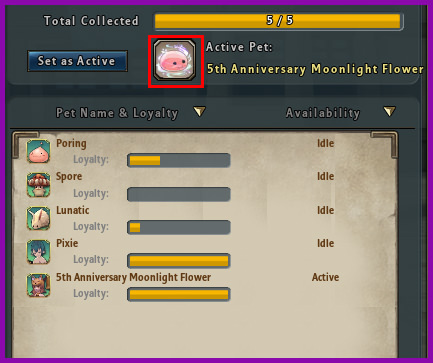 The Introduction phase of the Cute Pet System grants access to 5 types of pet: Poring, Spore, Lunatic, Pixie, and 5th Anniversary Moonlight Flower. Each of these Pets can be created using existing DNA fragments for that monster type. Please Note: The 5th Anniversary Moonlight Flower Pet Egg can ONLY be obtained during the 5th Anniversary event. This pet can only be leveled up with 5th Anniversary Moonlight Flower hatched eggs at this time, and more ways to increase loyalty level will be added as the next phase of the Cute Pet System is launched. Level 1 Loyalty for a Poring requires consumption of 10 Hatched Poring Eggs. Level 1 Loyalty for a Spore requires consumption of 10 Hatched Spore Eggs. Level 1 Loyalty for a Lunatic requires consumption of 10 Hatched Lunatic Eggs. Level 1 Loyalty for a Pixie requires consumption of 20 Hatched Pixie Eggs. Level 1 Loyalty for a 5th Anniversary Moonlight Flower requires 40 Hatched Moonlight Flower Eggs. The special anniversary edition of the Moonlight Flower pet will have a unique buff and aura. NEXT: MVP Update: World Bosses, Cute Pets, & Legendary Cards!